Miami - A recent push by Florida lawmakers to stick with daylight savings time all year long could end the confusion of having to change the clock twice a year but could cause multiple problems for the state’s Orthodox Jewish residents. As previously reported on VIN News (http://bit.ly/2FEXdFW), the Sunshine Protection Act would create an extra hour of daylight before nightfall by both starting and ending the day an hour later from November through mid-March. Having winter sunsets taking place an hour later could be beneficial to tourism, a major component of the state’s economy, but could wreak havoc on morning minyanim, explained Rabbi Moshe Matz, executive director of Agudath Israel of Florida, with neitz hachama, the earliest time to daven Shmone Esrai, taking place as late as 8:05 during the winter. The proposed changes would also create inconveniences for Florida’s Jewish community. The bill, which has already been passed both houses of the Florida legislature, is headed for Governor Rick Scott’s desk and Rabbi Matz called upon Florida’s Jewish community leaders, institutions and residents to reach out to the governor and respectfully voice their opposition to the plan. The Agudah has also been contacting Florida lawmakers and explaining to them why the proposed plan would be detrimental to the state’s Jewish community. If approved by Scott, the bill would still need to be passed at the federal level. While the time change issues may be new to Florida, Jewish residents of Cleveland, South Bend and Detroit, all of which are located on the westernmost edge of the eastern time zone, have already been dealing with this issue for years. 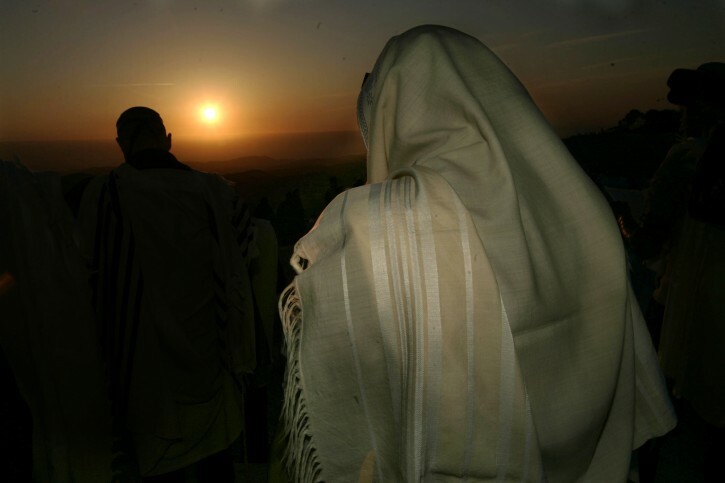 Rabbi Asher Eisenberger of Detroit said that on the days when sunrise is close to 8 AM there are many who put on their tallis and tefillin at the start of davening when it is still dark, but delay making the appropriate brachos until the very end of Shacharis when the proper zman has passed. Peculiar that a small minority hopes to overrule the majority because of conveniences specific to their religion . Morning minyan, I understand. But motzei shabbos flights and restaurants? That should determine if DST remains throughout the year or not? Sounds like extreme entitlement. Disney and Universal are the backers of this new legislation. They used their lobbyists to help craft and pass this legislation. There is no evidence that this bill enjoys the support of a majority of Floridians. So maybe every afternoon they should switch to Daylight Saving Time and every night switch back to Standard Time? Hashem keeps the time-zone of Eretz Yisroel, that's how He keeps Shabbos. So for us too, we have to keep all our Mitzvohs, including Kabolas Shabos, according to when its Shabbos in Eretz Yisroel. The whole world, north and south of the equator keep the Yomim Tovim according to the Seasons of E"Y. If you don't agree, please bring proof from anywhere in Chazal. Columbus, Ohio, where I've lived for decades, is indeed located at the western end of the eastern time zone. Hence, Havdalah during the summer months, may not occur until after 9:30PM, as it gets dark here about 40 minutes, after it does in Brooklyn. Also, Neilah on Yom Kippur and Shofar blowing, doesn't usually occur until about 8PM; in Brooklyn, it occurs about 7:15PM. In the morning, at this time of the year, we cannot say the brochas for Talis and Tephillen, when it is still dark, and have to delay saying those brochas. We've been dealing with the above issues for decades. However, unlike the complainers in Florida, we have not annoyed our legislative officials with this issue. Our brethren in Florida are going to have to deal with that issue, and should not dictate such policy to Florida state officials. “ Hashem keeps the time-zone of Eretz Yisroel, that's how He keeps Shabbos. So for us too, we have to keep all our Mitzvohs, including Kabolas Shabos, according to when its Shabbos in Eretz Yisroel. The whole world, north and south of the equator keep the Yomim Tovim according to the Seasons of E"Y. So all Jews are mechalel Shabbos part of the year? where is your source that Hashem keeps the "time-zone" of E"Y? To avoid confusion EST can be used all year. Or to create complete confusion combine EST and DST so that Florida would be 1/2 hour out of synch with the rest of the world no matter what season. That seems somehow appropriate for Florida. As someone famously pointed out: "Where there is a will - there is a halachic way." “ So all Jews are mechalel Shabbos part of the year? The Chiddoh says that Hashem uses the time-zone of eretz Yisroel. It's also regarding that the Malochim only say Shira at night. Yes, if we don't start the Shabbos when it's the Shkia in Eretz Yisroel, then we are being Mechalel every Shabbos.